The outcrop on Rte. 23. Dark stratum in middle marks boundary between 2nd and 3rd cycles. We have been philosophers, contemplating time itself these past few weeks. We’ve been gazing up at the Catskill Front. There, before us, were millions of years of history: petrified into the strata of the Catskills. Rip Van Winkle spent 20 years sleeping up there, but those rocks have slept for nearly 400 million. I’d like to take you up there to see those venerable lithologies, but it’s winter and not a very good time to climb up into the mountains. Fortunately, we won’t have to wait for spring; there is a better strategy. The Catskill sequence, happily for us, begins in the Hudson Valley. You can go and see its strata, up close and right along the highway. No climbing is needed. Find your way to the intersection of Routes 32 and 23 near Cairo. Then travel just the shortest distance east on Rte. 23. There, alongside the west bound lane, is a fine outcropping of strata. These are mostly sandstones, but there is some shale as well. This is the Catskill sequence up close. These are virtually the same rocks that make up all of the Catskill Front. We have been gazing up at them, but here we can look them right in the eye. And maybe it is time to stop being philosophers and start, once again, being geologists. Pause and survey the whole outcrop. You will, I hope, be able to see that it is broken up into three separate horizons of stratified rock. In other words there seem to be three “packages” of strata here, laid out, one atop the other, in a vertical sequence. As geologists, we always start at the oldest layers of rock and those are the ones at the bottom of the outcrop at its western end. That first package of strata is the least well exposed but let’s start there. You will see a sequence of thickly bedded, light colored sandstones. Above them the stratigraphy grades into finer grained, thinner bedded material. This has a greenish gray to brick red color. Red strata at very bottom are overbank floodplain sediment. Gray sandstones, above, are river deposits. Notice some river strata dip to the right. These are typical river cross beds. This stratigraphy is repeated in the next package and in the third. In other words we are looking at cyclical events in a cyclical stratigraphy. In the second package you can see that many of the thick sandstone strata are inclined to the west (left). This is typical of river channel sediments. Each of the three cycles begins with this sort of river channel sandstone. The overlying, finer grained materials are petrified soil profiles, literally fossil soils. So, if you follow all this, each cycle represents the presence of a Devonian age Catskill Delta river channel, overlain by a floodplain soil. And it happened three times. So, what was going on here and how does it relate to an ancient delta? There were two sedimentary dynamics back in Catskill Delta days. First those ancient rivers were what we call meandering streams. They formed beautiful, sinuous channels that literally snaked back and forth across their delta floodplains. This process, called river meandering, is a very slow one but it is effective over time and it can still be seen in many modern rivers. But it is slow and that gets us to the second dynamic. Remember, from those earlier columns, how the sediments of the Mississippi Delta are sinking and that the sinking is slow? Well, our Catskill Delta was sinking slowly too. Gradual river meandering was matched with slow crustal subsidence. The rivers had a back and forth motion. First the river would meander one way for quite a long time and then it would return. Meandering “back” was easy, but, by the time a river meandered “forth” the crust has already sunk quite a good bit. A new river channel/ floodplain “forth” sequence would be laid down on top of the old “back” one. If meandering continued, and it would, then a third horizon (cycle) would be deposited on the same subsiding delta. That’s what deposited the three cycles we see on Rt. 23. Did one meandering river deposit all three cycles? I don’t know. Did one or several rivers meander across this site? I don’t know, but it doesn’t much matter. The important thing is that we can look into one outcrop and recognize very typical chapters in the history of the whole Catskill Delta. It was subsiding, its streams were meandering, and all of it behaved very much like the Mississippi Delta of today. The Devonian Catskill Delta was the virtual twin of today’s Louisiana; only time has changed. 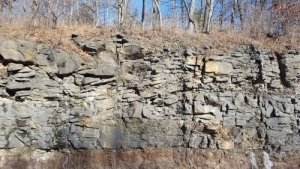 Now: look at the outcrop and then up at the mountains again and appreciate that these were the kinds of processes that formed all the rocks of all the Catskill Front.